Thanks to my friends at Post for sending the goods to inspire this recipe. My little boy loves Smoothies! When we saw this recipe I knew we would be trying it! How was it? Dessert worthy delicious! It was easy to make and everyone loved it, including my husband who is picky about Strawberry flavors. Open container of strawberry yogurt and dip whole strawberry into yogurt. Roll in crushed Cocoa Pebbles. Place in freezer until ready to serve. 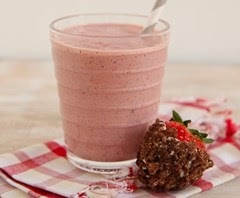 In a blender, add strawberry yogurt, Cocoa Pebbles, strawberries, chocolate milk and ice. Blend until combined. Pour into serving glass and garnish the edge of the glass with the cereal coated whole strawberry. Makes 1 glass. 12 ounce serving. Thanks to Post for the use of their recipe and image.